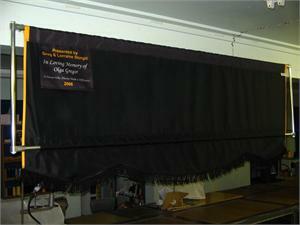 Purpose: To carry and support a marching banner in a parade or procession, using provided handlebars. Important Note about Vertical Bar: If you are ordering a custom marching banner from us, we can adapt the vertical height of the frame to match your specific banner. 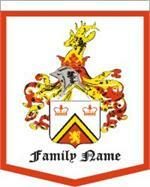 This can be an important issue because the position of the copy and designs vary from banner to banner. 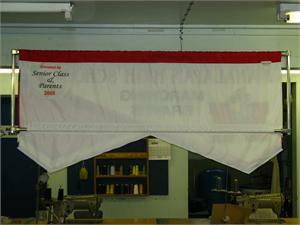 If you are purchasing the frame for use with an existing banner, you must examine the banner to determine the vertical height of the frame, and indicate this measurement in an email to us. 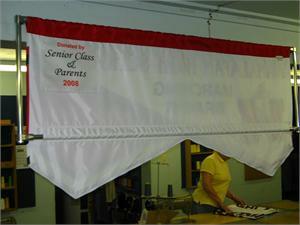 Your existing banner should have a frame sleeve sewn to the backside of the banner or side loops that can accept the bottom bar of the frame at the correct height. See diagrams above. Measuring from the backside, the height measurement is taken from the top of the top pole hem to the bottom of the frame sleeve. The frame is assembled from a set of components, including poles, coupling elbow and t-connectors, etc. A standard Allen key is supplied to tighten components. 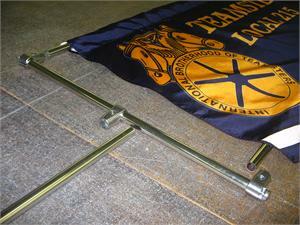 The frame can be mounted on an optional stand to display the banner when not being carried.